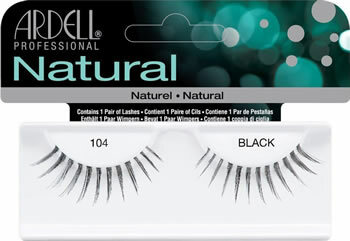 Ardell Fashion lashes #104 are made from 100% sterilized human hair. These natural looking false eyelashes have a full blunt cut. This full style is available in black only. Comparable to Ardell 101. For additional product details & how to apply information, please HERE. 2. Align your #101 Ardell false lashes gently to cover over your natural lashes and gently press them together. Make sure not to put mascara on your natural lash beforehand.